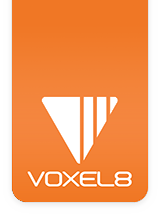 You’re ready to run your first print on your Voxel8 Developer’s Kit. 1. Verify the following things before printing. ✓ Build Plate is installed and kinetically coupled. ✓ Build Plate has a blue tape square applied. ✓ Filament is loaded and has successfully dispensed some thermoplastic material. 2. To print your first model, select the “1stprint” entry from the front touch panel (see Picture 001). Picture 001: File Listing on the Front Panel Display. 3. Press the “Print” button (see Picture 002) located on the front panel display, and your print job will start after the extruder heats up. Picture 002: Printing your first plastic part. 4. Wait until the print completes (see Picture 003) and the machine has stopped operating. IMPORTANT NOTE: Be CAREFUL when removing printed parts from the Voxel8 build plate using sharp instruments such as those indicated above. Remove the print from the build plate using the Voxel8 supplied flexible putty knife (or a razor blade) to help carefully pry it up from the blue tape square you previously applied. Picture 003: Voxel8 calibration print (PLA only). NOTE: You can find this print, including the .STL and .gcode in the downloads section of the site.